I just saw the coolest thing a few minutes ago. I was watching Jim Rome Is Burning on ESPN, and Carl Edwards was serving as the correspondent at the end of the show. Edwards was walking around interviewing other NASCAR drivers at Charlotte Motor Speedway, getting ready for this weekend's Bank of America 500. 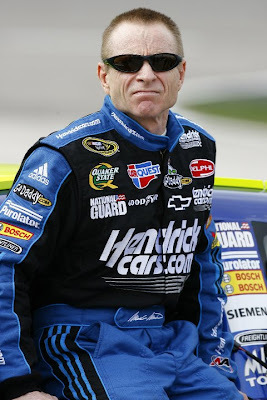 When he's talking to Mark Martin he says, "Mark has a diverse taste in music. What are you listening to right now?" Mark replies, "Gucci Mane's got a new album out, so I'm listening to that." Yes, the 51-year-old, who's currently the oldest driver in the NASCAR Sprint Cup Series, is a hip-hop head. Can you imagine him speeding down the racetrack with "Gucci Time" blaring out the windows? Martin said he's also playing Eminem's latest album.